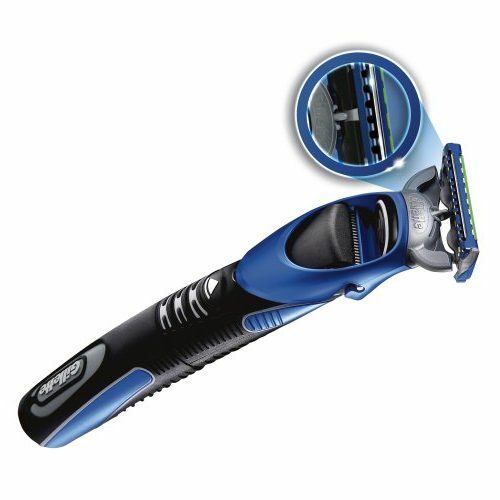 If you are in search for beard trimmer that is also a body grooming equipment, then this Gillette Fusion 3 in 1 is the right device for you. It will function like a regular razor as well as the electric trimmer. It is excellent to have a device that will give you any kind of trim or shave you want. Men loves products from Gillette ever since they first started manufacturing. The name “Gillette” is loved by men of all generations when it is about shaving. The Pro Glider comes with a lot of features such as being safe in the shower, being usable in all parts of the body along with face and being tested by dermatologists. It comes with three combs which lets the user have various lengths for grooming. You can achieve a close shave, stubble look or any other style you want. You can use the blade directly on the skin by getting rid of the comb. It will help for edging and shaping or a close trim. Unlike other companies, this does not come with the exact numbers or measurements for cutting. It is just labelled as one, two and three. You can start from the highest and go down to match with your choice of style. This Gillette Fusion device has a blade cartridge that has two sides and a lubricating strip. The first portion is for regular shaving and the other one is for getting the look you want with trimming. If the blade stops working, get another cartridge. If you notice the strip on it, you know that the blade is not going to function anymore. You have to alter and get a new blade. The razor comes on and off easily and you can get a new one from the packet of blades that comes with the Gillette razors. You can use them without any shaving cream if your hair is not that coarse or rough. The blade is two and half centimeter wide which can be beneficial for you. You can easily go all over your face. It is not suitable for men in rush because they can get cut and some areas can look strange. The width of the blade increases when you attach the combs. The device also requires oiling to retain its good condition. It is not going to create confusion that whether you want to use it with a cord or cordless. It requires a single battery and you can use it anytime, even in the shower. You do not have to worry about cables, charging or electrical shocks. If you can purchase high-quality batteries, you will get best results. Users are happy with this device because of its longevity and durability. Since it is tested by dermatologists, it is perfect for men with sensitive skin. It is waterproof and it does not come with unnecessary attachments or equipment. It comes with a rubber grip that makes it easy to hold and the size makes it fitting. This entry was posted in Gillette on April 12, 2018 by Professional Beard Trimmer Reviewer.